A tap on the Documents button in the Main Menu : all processed documents are shown. 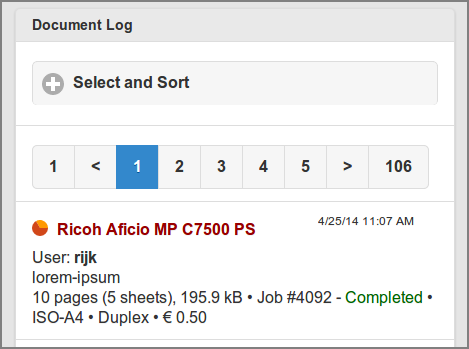 A tap on the Log button in the User List: all documents processed by the selected user are shown. The user's name is shown in the header and the Select and Sort is within the scope of this user. A tap on the Log button in the Queues List: the Select and Sort is initialized with, and applied for the selected Queue. A tap on the Log button in the Proxy Printers List: the Select and Sort is initialized with, and applied for the selected Proxy Printer. The creation date at the top right corner. Source or destination, shown in a color depending on its type. A SavaPage Queue, like "/printers/", is displayed in blue (when RAW printed to the default Queue the word “Printer” is displayed, driverless printing shows “WebPrinter” or “MailPrinter”). A PDF is shown in green. A Proxy Printer, like “Ricoh Aficio MP C7500”, is displayed in red prefixed with an inline pagometer Pie-Chart. The red color in the chart represents the number of pages in the job. The orange color represents the number of printed sheets. User: the user id as creator of the document. The document name, with optionally (PDF export) the PDF author name, subject and keywords. 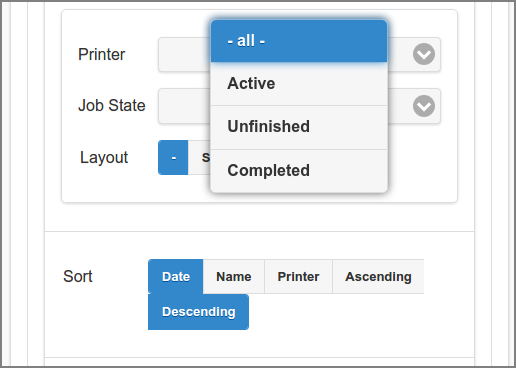 In case of a Proxy Print Job, icons or indicate the presence of a Print Archive or Print Journal. Pressing the “Eye” button at the bottom of the document entry will download the printed PDF. See Section 4.10.14.9, “Document Store”. The CUPS Job number (Proxy Printer only). The CUPS printing status: Pending, Held, Processing, Stopped, Canceled, Aborted, Completed (Proxy Printer only). The paper size, like "ISO-A4" (Queue and Proxy Printer only). "LH" indicator in case a letterhead was applied (Proxy Printer and PDF only). "Duplex" indicator (Proxy Printer only). "DRM" indicator when exported PDF was encrypted (PDF only), or printed document was an encrypted PDF. (Queue only). "Denied" indicator when printed document was an encrypted PDF and such printing is not permitted (Queue only). See Section 12.7, “Printing Encrypted PDF”. Owner ("O") and User ("U") password indicators (PDF only). 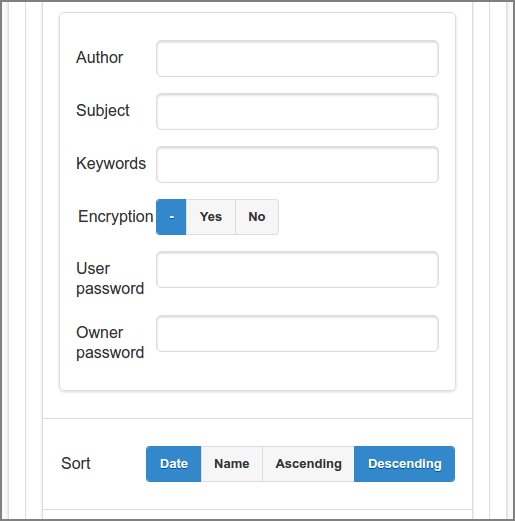 Depending on the selected Type, selection and sort options are shown or hided. However, there are common selections for all document types as discussed at the screenshot below. Select a Document Name by entering a name part (fragment). Select a creation Period by entering a From and To date. Tap the x button after a date to clear it. See this example Data Selection Dialog. 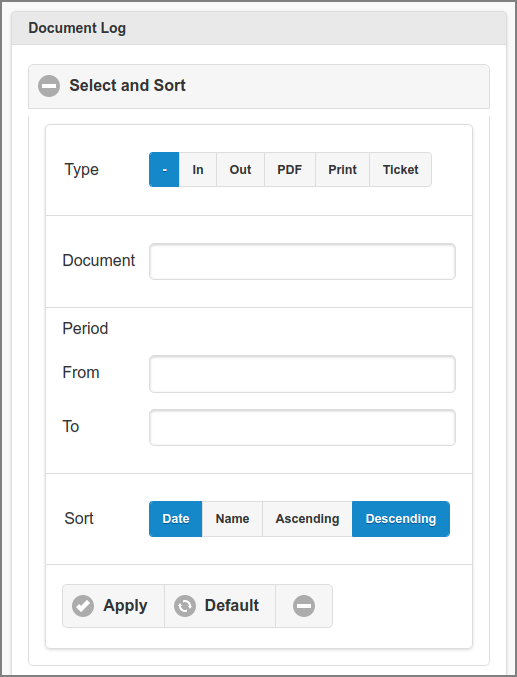 Documents can sorted Ascending or Descending by creation Date or Name. A selection on User password. A selection on Owner password. A selection on Job State. 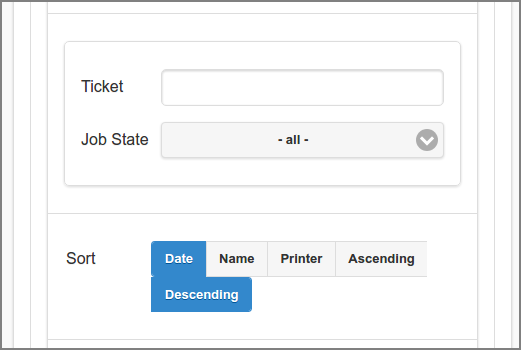 A selection on Ticket is added (at the expense of the Printer selection). You can enter any part of a Ticket Number. Selection on Layout is dropped.